I always save the cover for last. When I’m making an art journal, I complete all of the inside pages first, and then decorate the cover as a last step. For this particular art journal, I wanted to preserve the title of the book (“How to Make Good Pictures”) since the subject matter of the book (photography) became the theme of this particular art journal. So I saved the title and added treatments and objects around it. I wanted this cover to be very textural. I used modeling paste applied through several different stencils to create some of the texture, drywall tape (which provided an instant mesh grid texture), and crumpled tissue paper applied with Mod Podge. I let these all dry, and then painted everything (except the title) with black acrylic paint. I used a dry-brush technique to apply various colours of metallic silver and gold paint, which really brought the texture to life. 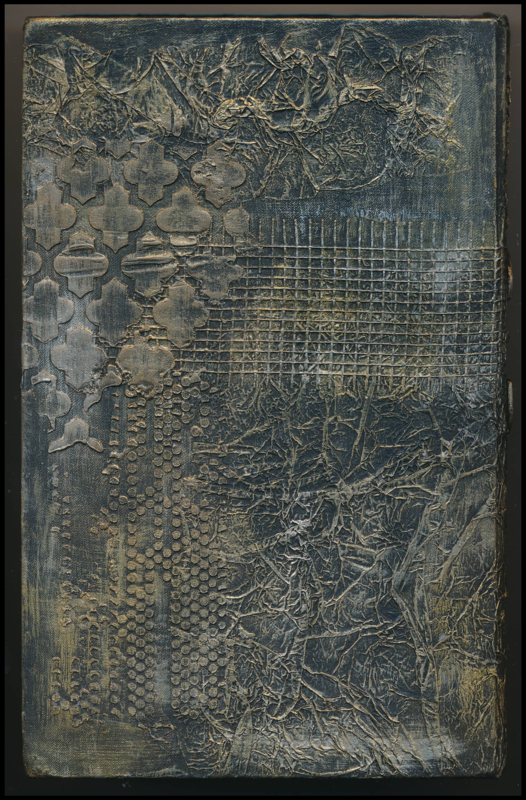 Once I was satisfied with the textured background, I glued a variety of items to the cover in layers: a strip of photographic negative, washi tape, a clock hand, gears, keys, postage stamps, clock parts, buttons, calligraphy pen nib, image, and more. The trick here was to keep adding layers until I was happy with the look, but not to overdo it! I am pleased with the way the cover turned out. This was a fun art journal, from cover to cover!